If ever there was a record that kind of sums up the problem with Record Store Day, this is probably it. An overpriced reissue of a record that there wasn't much demand for. That being said, I bought it, so I'm definitely part of the problem. As much as I can take a step back and realize this is the epitome of why some people hate Record Store Day, I just couldn't convince myself not to buy the fancy colored vinyl versions of two of the records I completely wore out as a kid. I had both of these when I was younger, though I had them on cassette. The funny thing about these is that the cassette versions came attached to LP covers. It was kind of weird, but I was appreciative of the larger artwork way back when. I'm most familiar with the first Wrestling Album. It has all the hits. "Real American," "Grab Them Cakes" by the Junkyard Dog and "Cara Mia" by Nikolai Volkoff. All these years later they still make me smile as does the super wacky version of "Land Of 1000 Dances" featuring a who's who of 80's wrestlers delivering some lyrics that are quite a bit different than the originals. Piledriver is not as fresh in my memory, so it was kind of funny listening to it for the first time in more than 20 years. The Demolition theme song is still the best thing on this record, though I take some perverse joy in "Girls In Cars" by Strikeforce, "Stand Back" by Vince McMahon and Koko B. Ware singing "Piledriver." 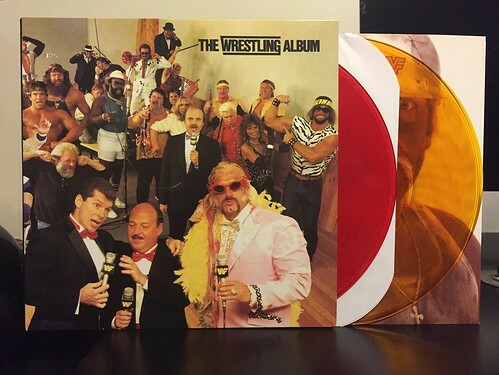 The two LPs come in a gatefold cover for the Wrestling Album. It was a nice touch having the inner sleeve for the 2nd LP mimic the original Piledriver artwork. I'm not going to listen to this record very much. Most of the songs on here are pretty bad. But it is a definite slice of my child that I think is fun to revisit every so often. Since I never grew out of watching pro wrestling, I guess it makes sense that I never really grew out of listening to wrestlers singing either.